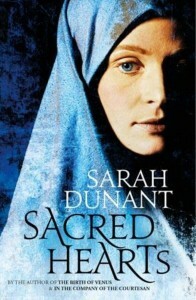 Win a copy of Sacred Hearts by Sarah Dunant! From book jacket: 1570 in the Italian city of Ferrara, and the convent of Santa Caterina is filled with noble women who are married to Christ because many cannot find husbands outside. Enter sixteen-year-old Serafina, ripped by her family from an illicit love affair, howling with rage and determined to escape. Her arrival disrupts the harmony and stability of the convent, which is overseen by Madonna Chiara, an abbess as fluent in politics as she is in prayer. She gives the novice Serafina over to the care of Suora Zuana, the scholarly nun who runs the dispensary and treats all manner of sickness, from pestilence and melancholy to self-inflicted wounds. As an unlikely relationship builds between the two women, other figures stand watching and waiting, most notably the novice mistress, Suora Umiliana, a crusader for ever stricter piety, and the mysterious Suora Magdalena, incarcerated in her cell, with a history of ecstasy and visions. While on the other side of the great walls counter-reformation forces in the Church are pushing for change, inside, Serafina’s spirit and defiance ignite a fire that threatens to engulf the whole convent. Sacred Hearts is a novel about power, creativity and passion – both of the body and of the soul. Hidden history brought alive by a wonderful storyteller, renowned for her Italian Renaissance novels.